It has been nearly a year since the paradigm-shattering study on the wolf and coyote genomes was released. (vonHolt 2011). The study examined 48,000 SNP’s (single-nucleotide polymorphism) in the genomes of these species and compared them to each other. In this way, the researchers were able to see which animals were most closely related to each other. The study was the most in-depth analysis of a wild species’ genome that had ever been performed, and it revealed that several sacred cows in wolf taxonomy are not what they have been proposed to be. The so-called “Eastern wolf,” which lives in Quebec and Ontario, has been proposed to be a unique species. Mitochondrial DNA analysis suggested so, as did some limited microsatelite analysis. The same was found for the red wolf of the southeastern US. Most of these studies were designed to counter Robert Wayne’s study that revealed that all red wolves actually had coyote mtDNA. He initially contended that they were hybrids between wolves and coyotes, but red wolves were still worthy of conservation because a large number of wolves had coyote mtDNA sequeneces. Wayne also found at least one red wolf with wolf mtDNA sequence, which really raised a red flag. Although most red wolves were found to have coyote mtDNA, finding one with wolf mtDNA was really indicative of these animals being of hybrid origin. Of course, this drove some people really crazy. Ron Nowak, a comparative anatomist who worked for the US Fish and Wildlife Service, tried several times to connect the red wolf to any number of prehistoric wolf-like canids that existed in North America, as well as claiming that the reason why these animals appeared to have coyote mtDNA is because they, as native North American Canis, would be more closely related to the coyote. It would not necessarily be indicative of hybridization. Mitochondrial DNA is inherited only maternally, and we do know that when wolves and coyotes mate in the wild, the hybrid is almost always a male wolf mating with a female coyote. So we have this problem of certain animals that are called wolves that have coyote mtDNA. These wolves represent an ancient species that evolved from the same ancestor as the coyote. These wolves are the same species as other wolves. They just have coyote mtDNA from a coyote that entered the gene pool in recent times. These wolves are a unique species that resulted from an ancient hybridization between wolves and coyotes. I generally came to accept a sort of hybrid between 2 and 3. I thought that red wolves and Eastern wolves were the result of an old introgression of coyote genes into the wolf population. When the first wolves came across the Bering Land Bridge, they likely didn’t come in large numbers and as they came down into the middle latitudes of North America, the only available mates would have been coyotes. They mated with female coyotes and carried coyote mtDNA into Eastern North America. However, the vonHolt SNP study changed all of this. It essentially rendered all previous hypotheses and findings moot. What this study found was the the wolves with coyote mtDNA, the red wolves and those of the Great Lakes and Eastern Canada, had SNP’s in common with Canis lupus and Canis latrans. Eastern coyotes also had wolf SNP’s. And what’s more, all the hybridizations, except the one involving the Western Great Lakes wolves, happened after colonization. The Western Great Lakes hybridization happened between 600 and 900 years ago, but these wolves are only 15 percent coyote on average. Thus, after that initial cross, they have been breeding back into wolves. Red wolves were found to be almost entirely coyote, averaging 76 percent coyote and 24 percent wolf. Algonquin Park wolves, which have been much ballyhooed in the Canadian wildlife literature, are pretty close to 50/50 wolf and coyote. They averaged 58 percent wolf and 42 percent coyote. If these animals had been an ancient unique species, it would have come out in this analysis. Instead, this analysis found something more interesting. Wolves and coyotes are distinct species, but the edge between them is blurred a bit. Wolves and coyotes do exchange genes under certain circumstances. In this way, there is a sort of species complex between them. But what about discoveries of pre-Columbian wolves with coyote mtDNA? Rutledge found coyote mtDNA sequences in wolf-like canids that were living in Quebec 400-500 years ago. But these hybrids were around centuries after the wolves of the Great Lakes received their coyote introgression. Perhaps these pre-Columbian wolves with coyote mtDNA were initially more widespread. The Great Lakes and Quebec are actually linked as a waterway and the terrain makes it very easy for animals to move from one side to the other. The Great Lakes and into the St. Lawrence is a major pathway for Carnivorans. This is the path that coyotes used to enter the northeastern US all the way down to Virginia. So these two species have interbred at different times. The Eastern wolf and the red wolf are merely the result of hybridization, and they do not represent ancient species that are independent from the main wolf or coyote lineage. The same can be said for the Eastern coyote, which does have some wolf ancestry. As for the ancient species that Nowak and other hitched their arguments to, a much more likely explanation is that the coyote and wolf lineages have produced animals that look more like wolves or more like coyotes. The Arabian wolf is very much like a coyote. It doesn’t normally form large packs, and some individuals can be in the 25-pound range. The Honshu wolf was even more similar to a coyote and was reported to have occasionally matured weighing in the 20 pound range. And there is good evidence that coyotes during the Pleistocene were quite a bit larger than they are now. It’s likely that ancient North American Canis had the same proclivities. Different conditions produced selection pressures for different sizes, and one could get wolf-sized animals out of the coyote lineage. We’re seeing something similar going on with Eastern coyotes, which are evolving larger size and more powerful jaws in order to become better deer hunters. They get these traits from their wolf ancestors, but natural selection is also playing a role. So one needs to be careful of someone trying to use the fossil record to argue against genome-wide studies. The wolf conservation community has not accepted these findings. The US Fish and Wildlife Service just ignored the vonHolt study entirely. David Mech, an expert on wolf ecology and behavior, said it couldn’t be true because he’d never seen a wolf and coyote mate in the wild– as if that somehow contradicted the DNA evidence that they have and continue to do so! The paradigm says that the red wolf is the second wolf species. It is an ancient North America species that ranged all over the Eastern part of the continent. Too bad the evidence for this entirely exists in rather superficial DNA analyses and the speculations of paleontologists. The DNA simply says otherwise. And the red wolf and the Eastern wolf are fictional animals, the result of overly imaginative hypotheses and not enough hard science. Just because a fossil looks like an animal alive today doesn’t mean that it is the ancestor of the extant form. Making inferences from fossils will always be haphazard and speculative to a certain point, and sometimes, the DNA evidence totally contradicts and falsifies these inferences. Too bad it’s not being recognized in an official capacity. You are saying that people are so invested in their own answers, they do not pay attention to studies that contradict them? What are they, conservatives? You’d be amazed. 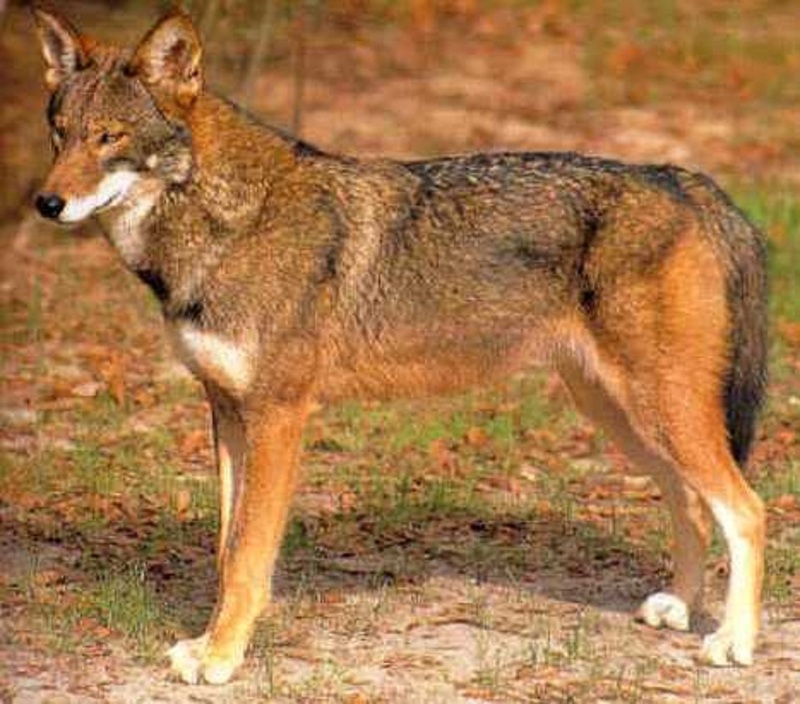 The US Fish and Widllife Service turned red wolves out in Eastern North Carolina and then spend all their time trapping coyotes out of red wolf range because they interbreed very readily. Well, duh! These animals are coyotes with some wolf in them, and they will breed with Eastern coyotes, which are also coyotes with some wolf in them. I have more on this to come, including a history of the term “red wolf.” Audubon supposedly named the species, but the animal he called a red wolf in Texas was, according to him, the same species as all the other wolves he encountered. Do wolves and Jackals do the same thing in the Old World? It’s not been confirmed if they do hybridize in the wild. It’s likely that if golden jackals do have some “wolf” in them, it would come from the pariah dogs with whom they share territory. Right now. I think the UCLA team that performed this SNP analysis on the coyotes, wolves, and the hybrid populations is doing the same thing on golden jackals. Only golden jackals can interbreed with Canis lupus, the dog, wolf, Dingo, and New Guinea Singing dog species. The other two species of jackal, which are endemic to Africa, are more distantly related to Canis lupus and coyotes than African wild dogs are. There is one other interfertile species in Canis, the Ethiopian wolf. They live where there are dogs and golden jackals– and true wolves, I’ll get to that in a minute– and one population did hybridize extensively with dogs in the late 90’s and early 2000’s. Now if you want to make things really confusing, there are actual Canis lupus wolves in Africa. This is a very recent discovery, but in the African part of Egypt there were these supposed golden jackals. They were also found in the Danakil Depression as well as other parts of Ethiopia. They were pretty wolf-like for golden jackals, and some older books called them wolf-jackals. A recent mtDNA study found that they were actually wolves. They had an old wolf mtDNA sequence that was about as old as the one found in Indian wolves in the southern part of the subcontinent. That’s actually the oldest mtDNA lineage in Canis lupus right now. Now, if these animals are wolves, they will have wolf nuclear DNA– which they probably will. It’s unlikely that male golden jackals, which are normally smaller than even coyotes, can mate with female wolves. I don’t care. I say, let’s conserve them anyway! They are very pretty and we have to take steps to control the deer population, anyway. It would be exciting to have a large predator on the eastern seaboard/appalachia. And there will be such a predator, anyway. If we let the red wolf go, coyotes and/or wolves will move in. Or feral dogs. Or feral people. Somebody’s going to eat those deer. More academically I have to wonder what we are trying to conserve. Are we conserving populations or just the individual genes? In archaeology it is not acceptable to destroy an ancient building just because we have identified the building blocks and the plan. It is not OK to destroy it just because it was not the first thing built on the site. See what I mean? Biologically I am also implying that the whole may be greater than the sum of its parts. Thanks to natural selection, the parts are selected to work together effectively. For example, gray squirrels develop reddish coloration as we go south, just like the wolves. Is there some advantage to this coloration in the hardwood forests? I’m wondering whether anyone has the audacity to think any of these threatened populations can be recreated from genetic scratch based on what we know today about genetics. A red wolf is a coyote with some wolf in it. All the coyotes in the northeast, the Great Lakes, and Eastern Canada are the same thing. What’s the point in conserving something that is already very common and does the exact same thing? Red wolves aren’t wolves. They are coyotes with wolf in them, just as all Eastern coyotes are. Conservation cost money. Lots of it. Save it for an animal that is unique and uncommon. Sorry I did not say what I meant. I would “conserve” them in the sense of not killing them but I would not try to save them from hybridization since it looks as if hybridization is the process that made them what they are. And it’s extinct in the wild. I was trying to argue on the basis of their appearance, red, as the name suggests and also on the fact (I think it’s a fact) that it’s been in its southern habitat for a long time. All of which suggests that some selection has probably occurred. What I envision is that every time an outcross occurs it is followed by another round of selection. So that the type changes, but does not change into either the northern gray wolf or the western coyote. It approaches whatever is fittest in that environment, something called the Red Wolf. The out-crossing does not demonstrate that the red wolf is not a legitimate species or sub-species. It’s just the way a small, isolated, population remains viable. We’re talking since colonization. That’s not a long time. Further, you get exactly the same thing when coyotes with wolf in them move into the South on their own. Reintroducing this animal was just like when the foxhunters in my area would import coyotes from other states. It’s just a coyote with wolf in it, and it’s not like we have no coyotes with wolf in them running around. Save the Mexican wolf. It actually is genetically unique and adapted for living in the Southwestern deserts, where it evolved tens of thousands of years ago. By “conserving the red wolf” you’re wasting money and time on something that already exists in the wild and isn’t even remotely endangered. The deer are certainly interesting. Maybe they’d like to join the Red Coyote in my imaginary sanctuary. Why is conserving the animal formerly known as the Red Wolf so expensive? I know one expensive concern was about preventing hybridization with coyotes. I should think this latest study should come as good news for the red wolf fans: it’s no longer necessary to protect them from hybridization. All you have to do is designate some land (and we already have parks, etc. ), turn them loose, and stop shooting/trapping. Ditto the Mexican wolf. For them we need a fence and lots of rabbits. We have millions of unemployed people and no lack of desert. We have unwelcome aliens wishing to work. AU put up a dingo fence years ago but we can’t build a sanctuary for mexican wolves. We are certainly feeble. I hate to go all OT, but that’s where we end up: it’s not the junk science, it’s the expense – this deer is more deserving than that dog – limited resources, etc. BTW, the red wolf does not look like the NY coyote to me. Of course, all but one of the coyotes were dead and I’ve never seen a real RW. ACtually, it does look at lot like a coyote because that’s what it is! Coyotes in New York can be nearly as large as a red wolf. Coyotes can approach 60 pounds and they are getting larger. Coyotes in the Northeast hunt deer– just like “red wolves” do. Ecologically, they are the same animal. A big coyote with some wolf genes. Ergo, it’s all about romance. There’s no good scientific reason to treat the red wolf any differently than a coyote, because that’s what it is. I don’t know why you’re not understanding this. Thanks for your patience. I don’t know whether I could distinguish between a RW and a coyote but I assume somebody can. As far as I can tell, the RW is a beautiful animal. Just my opinion. I notice 2 contradictory arguments running through this blog. One is that population X is inbred, must be rescued by outcross PDQ. The other is this one, that population X is out-crossed, therefore not pure, therefore not worthy of conservation. RW may be what happens when a small wolf population saves itself by out-crossing. Or may be that coyote genes unlock the red color in wolf. Or just in this inbred wolf. Who knows? But it might be regarded as an interesting animal that raises some questions. As long as there is somebody who can distinguish the RW by sight, IMO conservation should be the default position. We should be suspicious of a science that tells us that what we see isn’t there. I am in favor of conserving wolves with coyote in them (those that are over 50 percent wolf), but not coyotes with wolf in them (over 50 percent coyote). Does that make sense? Wolves could potentially be endangered, but coyotes definitely are not. I don’t think you’re getting that red wolves are coyotes with wolf in them, not wolves with coyote in them. I don’t care if they have coyote mtDNA– just don’t call these wolves a new species. You can’t tell an Eastern coyote from a red wolf. They are too similar in appearance and ecology. I am not in favor of arbitrarily contriving species or keeping subspecies pure for just the hell of it. However, if you allow certain subspecies to interbreed, you can create an outbreeding depression, like introducing a short coat from a tropical subspecies into a cold climate subspecies. I think that Ontario and the Canadian government’s promotion of the Eastern wolf species is quite intellectually dishonest. I’m not in favor of getting rid of them became they are mixes. I’m opposed to making so much hay about them as a new species, when they aren’t a new species. They are wolves that have coyote in them. R-man- you are a cutting edge thinker and this cuts right to the center of the species debates and fears of loss of a species as it is today. All species are landraces that select slightly differently in different places and times, some die out or die down, others move in and connect with the local dna, then boom they all become one breeding population. The longer the population breeds in isolation at the core, the more changes build up, but around the edges, there is always criss cross. Same thing with people…. and giraffes! I visualize this as all the spirals in “Starry Night” (You know, the one by VanGogh) Each spiral has a core that doesn’t get much exchange with the outside, but the edges of the spirals move and morph all the time- collecting, losing- and this is where the changes begin- on the cutting edges!!! I am very much in favor of returning wolves back to their former range. What I’m opposed to is using very poor science to promote fictional “wolf species,” so we can be pressured more into saving them. This crap makes it very hard to have a good answer for critics of wolf recovery, because the facts are on the side of these animals being contrived. And that gives the anti-wolf critics more fodder. But no, it’s better to pretend that these things are ancient wolves that lived here when there were dinosaurs– just before the flood. The Mexican wolf is the real McCoy when it comes to very unique wolf subspecies in North America, and it’s not getting the billing it deserves. The politics for Mexican wolves are tougher. Don’t we have Mexican wolves or some that are already cross-bred? Seems my local zoo just acquired a couple. Q is why are they here and not in the SW? All politics and $, I suppose. And Canada’s wolves? You know, the language of conservation is funny. I think they conservationists may be from another planet. Their way of making decisions tends to promote dishonesty about what these critters are. You have to “discover” whatever the money is there for. I am prowolf too. It is nice to think that even when we almost make wolves extinct, they combine a bit with coyotes and come back strong in a more adapted form, I guess. I love those Mexican wolves. I hope they do a bunch of genetics work on them and find ways to save their special dna- even if imeans considered hybreeding at some point. In any case, they are a good wolf cause and thinks for bringing them up.